3-Minute Healthy & Frugal Salad Dressing | Audio and video stories from Southwest Washington. Homemade salad dressing is one of the easiest, most flavorful ways to spice up healthy eating on the fly. I personally cannot bring myself to buy bottled dressing. In fact, over the past 4 years, I have bought just one bottle while traveling, simply so that I could enjoy some healthy salads by drizzling ready-made dressing over leafy greens stuffed into Ziploc bags while on the road. The price is just too painful to pay when delicious concoctions can be whipped up in 3-minutes time for the cost of just a few nickels. Furthermore, it is rather ironic that salad dressings, which are meant to encourage healthy eating through the consumption of more vegetables, are also one of the worst food products available on store shelves. I would guess that over 90% of the salad dressings on shelves are unhealthy. Even the majority of the best intentioned organic brands are loaded with the same cheap ingredients as standard dressing brands—rancid omega-6 oils (canola, soybean, safflower, sunflower) which promote inflammation, high fructose corn syrup, MSG, and trans-fats. These are only just a few of the more pronounceable ingredients used to top what could otherwise be a clean, beautiful, and nutrient-rich salad. So, why not make your own? It will serve you far better gastronomically, nutritionally, and financially. 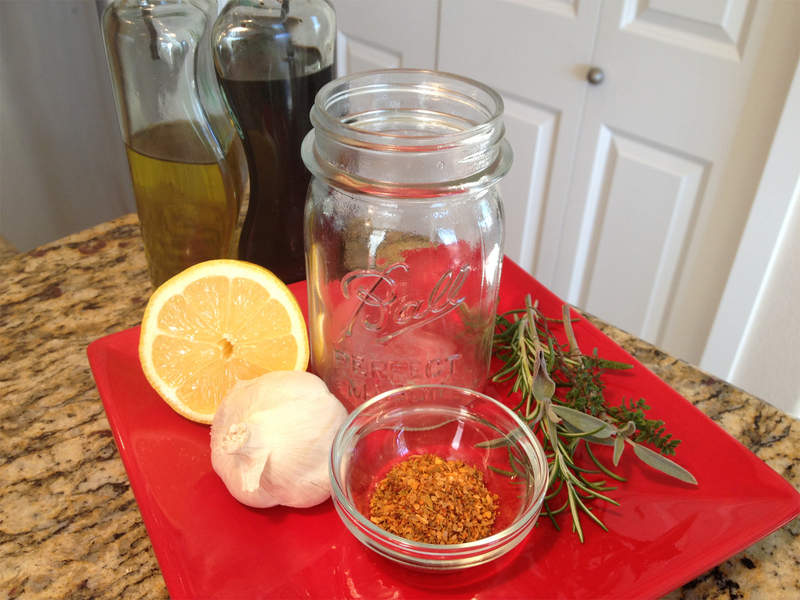 Here is my recipe template to make your own healthy and frugal salad dressing in 3-minutes or less. The best part of this recipe is that the ingredients are most likely always on hand, as it simply requires olive oil, vinegar, and spices. The options for flavoring your dressings are endless and there is no wrong way to make a recipe if it tastes great to you! Give your refrigerator a makeover and replace those overpriced, store-bought dressings by shaking up your own new favorites today. •	3 tsp. herbs/spices—fresh or granulated garlic, onion powder, ginger powder, cumin, turmeric, coriander seed, fennel seed, dill, cayenne pepper, mixed Italian herbs (a blend of oregano, thyme, and basil), parsley flakes, pepper, paprika, etc. Optional Ingredient Ideas: honey/maple syrup, lemon juice, sesame seeds, dijon mustard, tahini paste, tamari, miso paste—be creative! Combine all ingredients in a reusable glass salad dressing container or jar with a tight lid (such as a mason jar), shake well, and serve over your favorite salad or veggies. Refrigerate any extra dressing and use within 90 days. This same dressing is remarkably versatile and can be used as a marinade on fish and meats, mixed into cold salads (quinoa, tabbouleh, or other cold grains), and for a wide variety of other purposes. Pre-made bags of spices can also be put together into advance for traveling, camping trips, or for gifts.